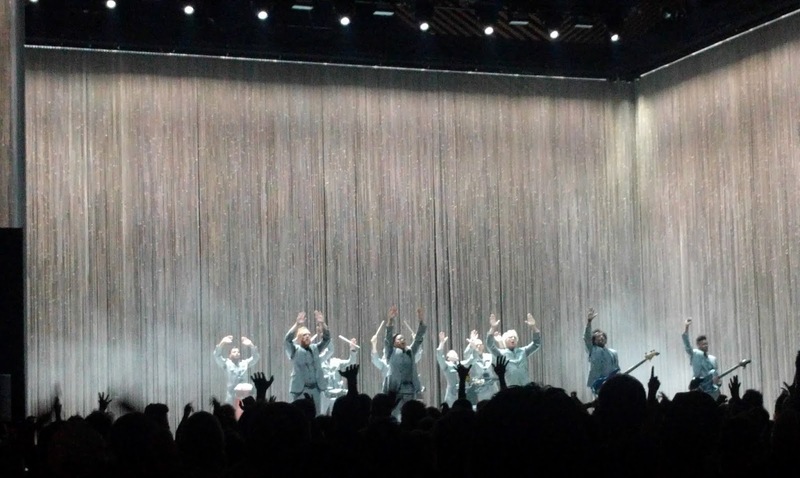 David Byrne is an erratic character. His post-Talking Heads work has been spotty and inconsistent, but he has been involved in a variety of musical, theatrical, and film collaborations, he is a well-regarded writer, and now he's become something of a cultural icon offering sage advice about music, technology, and people. Despite that I didn't find his new album particularly exciting (yes, even though most of it was co-written by Brian Eno), there has been quite a bit of hype about his stage show, so I figured it was worth a shot. Yasmine Hamdan is a Lebanese singer who has worked in a variety of styles. 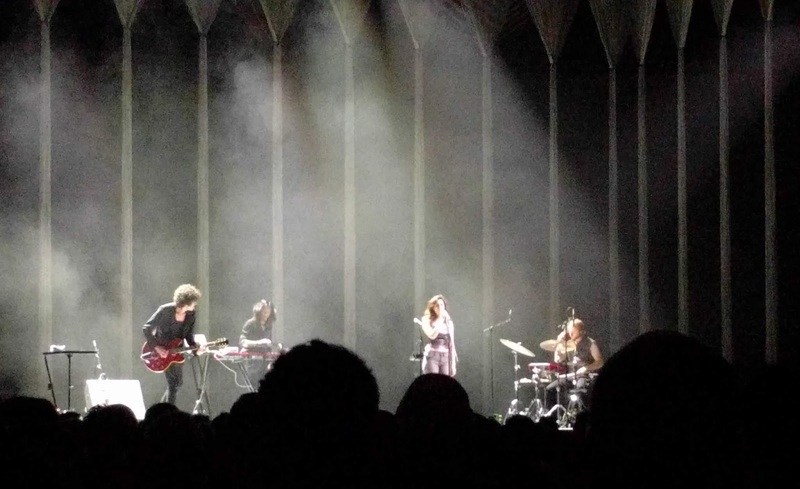 At this show, she was joined by a drummer, a guitarist, and a guy who seemed to mostly be playing samples. The sound was a balance of modern electronic and traditional Arabic folk music. Half of the drummer's kit was synthetic and the guitarist played half the set with an effects-laden ebow (and one song with an actual bow). Hamdan was a strong vocalist, and combined with the rhythmic music, she produced a rather dramatic effect. The guitarist and drummer were also quite skilled and had unique styles that helped set the mood, but the song structures were somewhat formless and nebulous. Despite the many aspects I enjoyed, it felt like there was an element I was missing, although this may have been related to my inability to understand the lyrics. 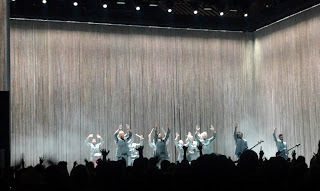 For David Byrne's set, the stage was surrounded in the back and on the sides by long, thin curtain strands, such that the audience could just barely see if a person stood behind them and the musicians could pass right through while performing. For the opening song, "Here", Byrne sat a table with a plastic brain on it and proceeded to sing while seated and then while manipulating the brain. The members of his band performed from offstage and occasionally appeared throughout the first two numbers, finally appearing in full for the classic Talking Heads song "I Zimbra", which was also when the audience collectively decided to stand up and start dancing. The band consisted of twelve members. Six of them played various forms of percussion: Gustavo Di Dalva, Daniel Freedman, Aaron Johnston, Tim Keiper, Mauro Refosco, and Davi Vieira. Chris Giarmo and Tendayi Kuumba provided backing vocals. Bobby Wooten played bass, Angie Swan played guitar, and Karl Mansfield played keyboards. Byrne himself also played electric guitar on several songs. All twelve performers wore matching gray suits and carried their instruments. Other than the occasional prop, there was nothing on stage. There was no drumset, no keyboard rack, no microphone stand, and no effects boards. Byrne claimed that everything was performed live, but he left out the important detail that all effects and processing had to be done by somebody offstage. The sound crew must have been skilled and well-practiced. The freedom of movement on stage was taken to full advantage. Even when the band were playing less exciting songs, the action on stage kept things interesting. At different points they stood in a chorus line, rotated in a circle, stood just offstage with their instruments peeking through the curtains, ran across the stage while a bright light at the front of the stage cast shadows upon the curtains, and danced about in every combination you could imagine. It made for a very energetic experience. The choice of songs was a widely mixed bag. Byrne played seven songs from his new album, American Utopia, eight Talking Heads songs (all but one from the classic dance-rock albums Fear of Music, Remain in Light, and Speaking in Tongues), four songs from various collaborative projects, one older solo song ("Like Humans Do"), and one cover. Oddly, or not, there was no overlap in material with the Tom Tom Club show I saw back in 2011. The highlights were, just as one might expect, the classic Talking Heads songs. The band brought the rhythmic complexity of the songs alive in a way that was almost hard to believe was real. The band was tight despite their physical choreography and the grooves were irresistible. The other particularly notable song was the cover of "Hell You Talmbout" by Janelle Monáe. The entire band performed percussion while chanting variations of "Say his name!" and listing the names of various Black Americans who were murdered by the police and/or as the result of racist violence. While the two consistent threads in Byrne's songs are a critical but wise and witty perspective on human perspective and a love of percussion, his songs explore a wealth of styles, albeit with varying levels of success. On stage, I often felt like the shifts in tone and sound were arbitrary and subject to whimsy. Sometimes it seemed like he was being weird just to be weird, or trying something purely for the sake of trying it. While I fundamentally appreciate such a willingness to experiment, the result is often that Byrne's songs come across as jarring, bizarre, ridiculous, or nonsensical. One gets the impression that Byrne's brain works in unusual ways, but even if half of his songs don't quite work, the half that do are brilliant. Combined with a very creative stage set, it made for a show well worth seeing.